Chinchillas are soft, beautiful pets, and just having one is enough. But some people enjoy breeding chinchillas. For those people, how to care for orphan babies should be a consideration. Pregnancy in chinchillas generally lasts for about 111 days. The average litter is two but can be from one to six. 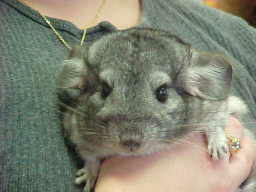 Chinchilla young are born with open eyes, fully furred and with teeth and are able to stand. The babies have the best chance at survival if cared for by their mother or another chinchilla. If the mother is unable to nurse her young due to illness or death, the young can easily be placed with another lactating female. If this is not an option, the pet owner must raise the babies. Be aware that orphan raising can be difficult and unrewarding. Using a mix of equal parts water and evaporated milk, orphan chinchillas can be fed with an eyedropper or pet nurser. Until they are four days of age, the young should be fed every 2 to 4 hours through the day and 1 to 2 times through the night. After 4 days of age, night feedings can be discontinued and the interval between day feedings lengthened. At about 1 week of age, begin offering moistened chinchilla chow. The babies will begin nibbling on the chow at about one week of age. Slowly reduce feedings as the babies begin to eat more solid food. Chinchillas are weaned at 6 to 8 weeks of age.